The present book is done in the manner that most of these different translations obey some pre-established rules among translators so that it may distort the dynamism and flexibility of the translated works. As a result, a reader may face some similar choices in the translated works. We recommend that if we try to put some energy (energize or motivate) into the words, we can preserve the dynamism and flexibility in the translated works. Positive and negative words are one of the ways by which we can energize an activity. These words carry emotional loads. They associate pictures and concepts. Emotions and images unconsciously have influence on the decisions of a translator. 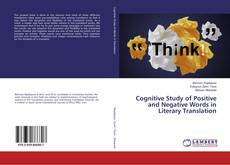 Decision-Making, Literary Translation, translation process, Cognitive Translation, Translator’s Competence, Positive and Negative Words.